The six-time world championship finalist opens up in his new book. Jimmy White: i don't blame anyone else. 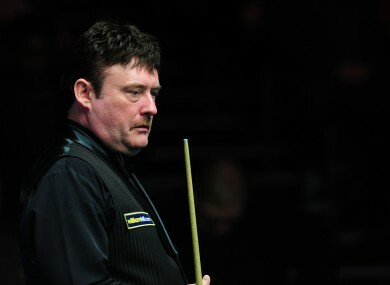 ONE OF SPORT’S great nearly men, Jimmy White, has told of his battle with crack cocaine addiction for the first time. The six-times Crucible runner-up says he smoked crack at the Irish Masters and drug abuse cost him ’10 world titles’. The ‘Whirlwind’ became a fan favourite at the Sheffield venue in the 1980s and 90s, reaching the world final in 1984 and in every year from 1990 to 1994 but losing on each occasion – four of those to Stephen Hendry famously. White, though, says he was concealing a drug habit which cost him up to £10,000 a month, moving from cocaine to crack. “I’m lucky to be alive” White, told The Sun, admitting drugs “probably cost me 10 world titles”. He also told of smoking crack with friend and fellow player Kirk Stevens in a hotel room at the Irish Masters. “Jimmy White … snooker hero … people’s champion … crack addict. Sounds far-fetched, doesn’t it? But for about three crazy months it was true,” he writes in his new autobiography Second Wind, serialised in the same newspaper. What to eat before hitting the gym or the pitch…. Email “Jimmy White: I smoked crack at Irish Masters, drugs cost me 10 world titles”. Feedback on “Jimmy White: I smoked crack at Irish Masters, drugs cost me 10 world titles”.